A storm system spinning off of Hurricane Norbert dropped several inches of rain in and around Riverside County this weekend, sending flash floods through the Coachella Valley. The California Department of Forestry and Fire Protection made at least 43 rescues in their service area, although no injuries have been reported yet. 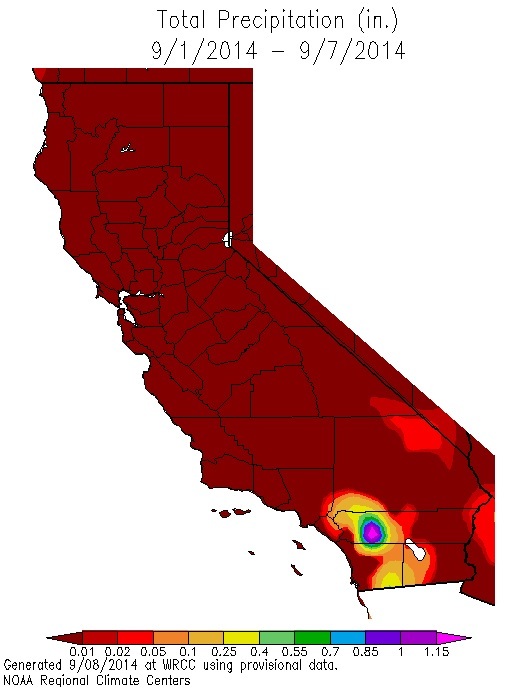 This unseasonal rainfall event will not have an impact on drought conditions in the state. Except for this storm system, the rest of the state received effectively no precipitation this week, which is normal this time of year. The water year ends September 30th, closing out a year where a majority of the state has received less than 50% of normal precipitation. The California Department of Food and Agriculture released the results of a survey that examines how the drought has impacted almond farms. The survey shows that more than 67% of respondents will rely entirely on groundwater this year to water their almond trees, while only 38% only utilize groundwater in a normal year. Some dry creeks are now flowing with groundwater as a result of Napa’s recent earthquake. New research suggests that, over the next century, the southwest has at least a 50% chance of experiencing a decade-long drought and a 20-50% chance of experiencing a “megadrought” (one that lasts more than 30 years). Next10 has released the “California Water Challenge,” an online simulation that lets users understand the impact of different water policy options. 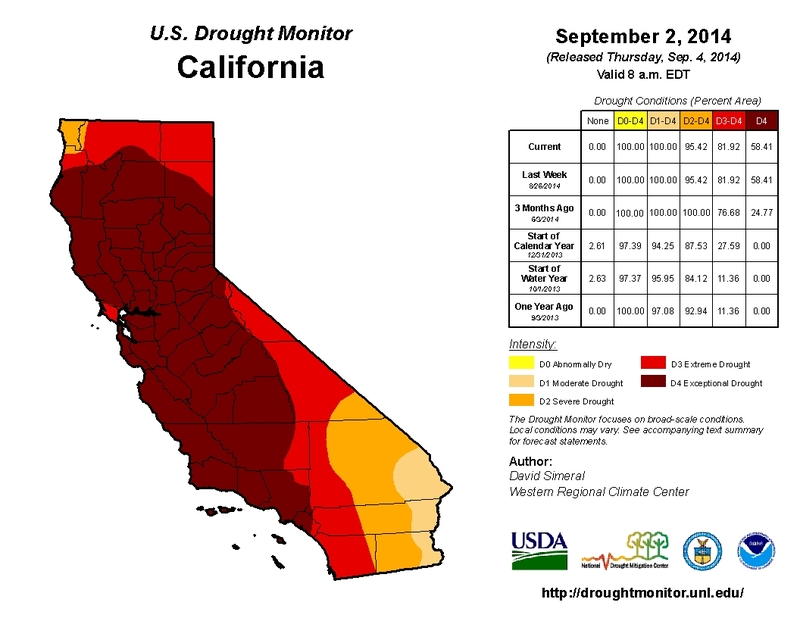 Drought conditions have not changed since last week. 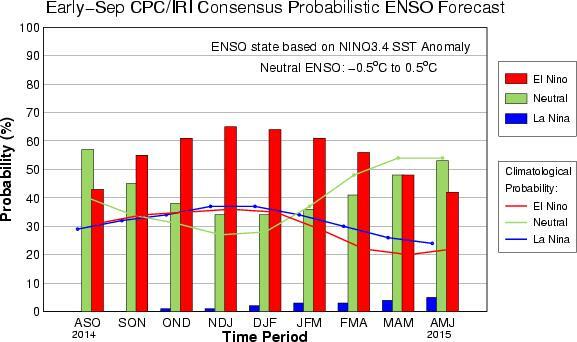 The probability of an El Niño developing this fall has dropped below 66%. 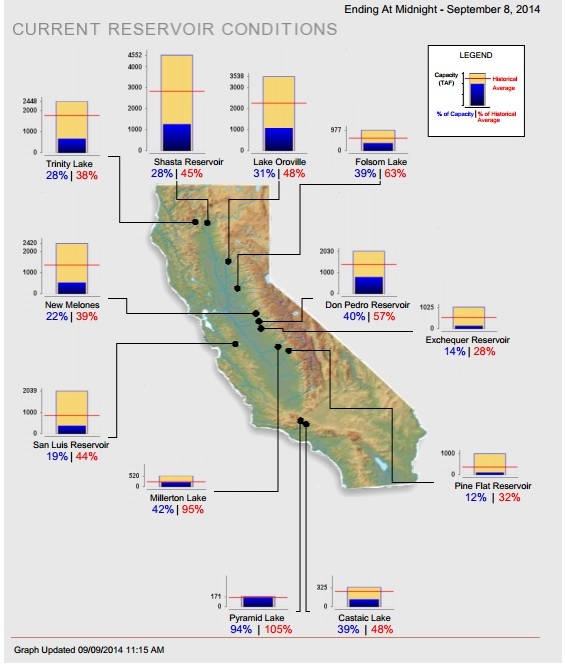 Statewide, California’s major reservoirs (representing more than 26.6 million acre-feet of storage), are at about 31% of total capacity and 52% of normal.